Are the paved hiking trails and even terrain proving to be boring or overpopulated? Do you want to get an exceptional view of the Smokies and break a sweat getting there? Why not take a trail “less traveled” where you can test your endurance? We’ve picked out three trails in the Great Smoky Mountains National Park that you should try if you’re willing to take the challenge! Plan on setting aside at least a day for this hike. You’ll want to take some snacks or lunch for when you reach the summit. The whole round trip is around 13.9 miles with steep elevations at times (especially once you hit the Appalachian Trail), but there is a huge pay-off at the end. You will be able to spot North Carolina’s Fontana Lake and Cades Cove from the 360-degree views at the top of one of the three peaks of Thunderhead Mountain. The best time to hike this trail is late June when you can see the blooming wildflowers and rhododendrons at the higher elevations. On your way, you might want to stop at Spence Field and check out the mountain laurel that springs up, along with other views. For more information, check out the All Trails page for the Rocky Top Trail. If you venture to Spence Field, you can take the option of going to the Eagle Creek Trail and journey south into North Carolina. There are places on the trail where heavy rain could flood it (although you could wade through), so check the weather and plan for a sunny summer day. As a side note, horses are welcome on the trail. If you want to start on the trail and head up to Spence field, you can find the trailhead at the base of Eagle Creek, beginning on the North Carolina side of the Smokies. It’s about a 9-mile trip one-way. There are plenty of stream/creek crossings (18 total) to make the journey interesting, and you’re likely to see plenty of flora and fauna. If you want to add camping to your trip, there are a few backcountry campsites off the trail. For more information, check out the Hiking Project website for elevation and distance graphs, so you can plot where your hike would be more difficult. This trail offers a view of a waterfall. If you start on the south end in North Carolina near Bryson City, you will end up within a half-mile or so of Clingman’s Dome, dead-ending on Clingmans Dome Road. 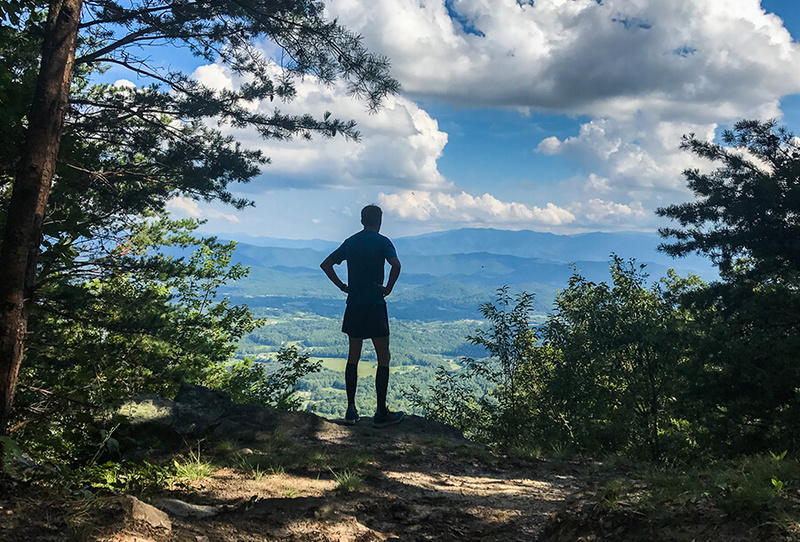 The Noland Divide Trail sets itself apart from other trails, because it’s in excellent condition and a favorite of runners before you get close to the Lonesome Pine Overlook. This is an endurance trail. While the grade is gradual up to the mountain, it is a long trail (22.2 miles round trip). You’ll skirt the perimeter of the Great Smoky Mountains National Park initially. Then you can take in stunning views at the Lonesome Pine Overlook (through the 50-yard access path), which provides an excellent opportunity to stop and take a break. There are some narrow parts of the trail and steep drop-offs. You’ll be able to view the Nantahala Mountains and Bryson City. For more information about the Lonesome Pine Overlook, check out Hiking in the Smokys. The Hiking Project website offers grade and elevation information you will find helpful. We hope you’ll try out some of these hikes. Ready to add another challenge to your hike? Pick up a pocket-sized Hike the Smokies booklet at one of the Great Smoky Mountains National Park visitor centers and track your mileage. You get a mileage pin after your first 100, 250, and 500 miles. Families can take the challenge with a family booklet and get pins at 10, 25, 40, and 50 miles. To learn more, visit their Hike the Smokies page.